It's easy! A painless 1 minute install will give you immediate notifications of over/under temperature or humidity conditions. 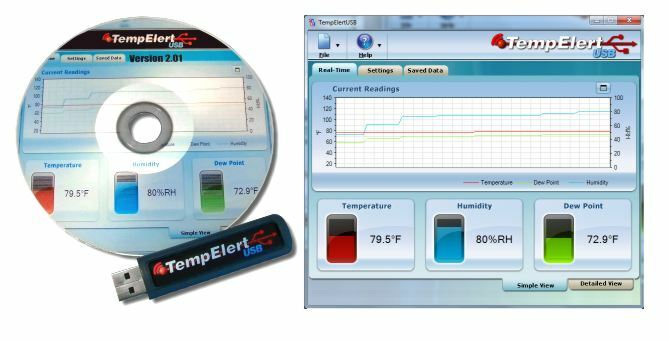 TempElertUSB is an economical solution to monitoring server rooms, food storage systems, greenhouses, vacation homes, or anyplace where you are concerned about temperature or humidity conditions causing damage to mission critical systems or processes. This simple USB device runs under 32 and 64 bit Windows based PC's, and is powered by your computer’s USB port. Runs on Windows Windows XP (32 bit only), Server2003/2008, Vista, Windows 7, Windows 8, Windows 10. Legacy downloads are available for Windows 2000 but are not officially supported. See our support page. BONUS - Included on the CD ROM is an optional use networked system shutdown program (PowerBug) that you can operate remotely to shut down all machines in a server room if you get an over-temperature condition. Quality - not some cheap Chinese knockoff - TempElertUSB is a solid solution for mission critical applications, why trust anything less? Service - we stand behind the product, we answer the telephone, we respond to our customers. Real people, and a real company - not a PO Box. 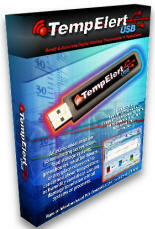 TempElert USB is available for next day delivery from stock if ordered by 2PM PST. Video: our 1 minute install!